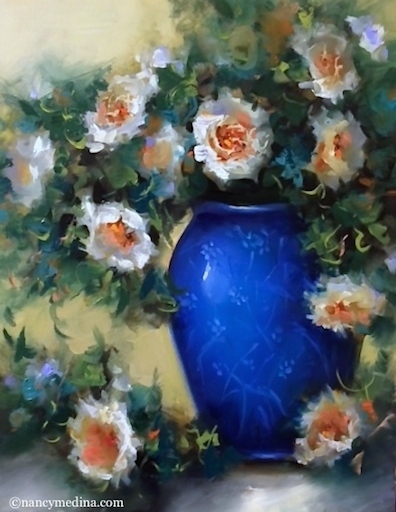 Nodding Off White Roses is the newest daily painting in Flower Mound Studio. Yesterday I spent time with my Mom. She always wants to hear about my trips. I sat on the edge of her hospital bed and told her about California, how beautiful the flowers were, how much I'd love to live there but doubt we could ever afford to move back. She said she hoped we didn't move away. She had three bowls of ice cream while I was there, and asked for watermelon but we were out. She had eaten the last of it before I arrived, and forgotten. We watched all of her favorite shows, Ellen, Jeopardy, and Wheel of Fortune. She gave AnnieBee one bite of ice cream, and then she ate half of a bacon sandwich. Everything we can get Mom to eat is something to celebrate. When it was time for me to leave, I told her she was my favorite person in the whole world, and kissed her goodbye. She said I was her favorite Nancy in the whole world. Each one of these moments may seem like such small things, but they are the most important moments of my life, these precious days with my Mom.